With the iGrill, you can insert a probe into whatever's on your grill. 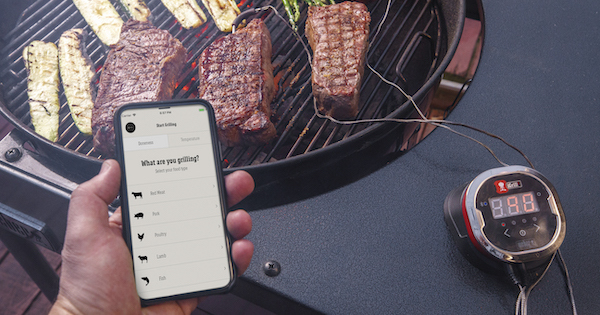 Then, using the iGrill app, you select what you're grilling and how you would like it done (either by selecting the desired doneness or by temperature or a temperature range). Then the app will alert you when your meat has reached the desired internal temperature - No need to monitor your grill at all! You can get great cooking results even if you're not among the "master class." Next, let's dig into the details of what the iGrill system can do so you can decide which type of iGrill is right for your needs. 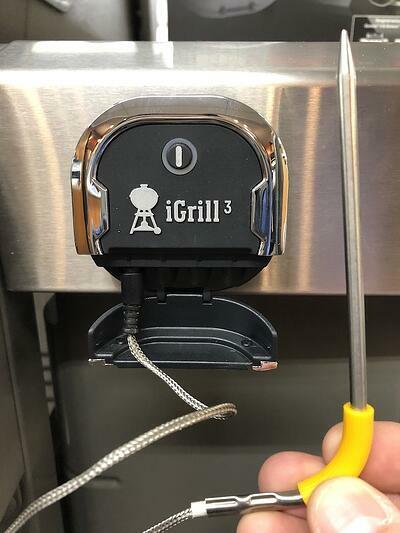 The iGrill Mini is the smallest and most basic probe out of the three. It has a Smart LED display that shows indicator lights for when the iGrill is powered on and connecting to your phone, and the lights change from green to yellow to red to alert you when you are close to or have reached the temperature you selected. The magnetic base attaches easily to any metal surface on your grill, and you should store it indoors between uses. It has a 150-hour battery life and prices at $49. The iGrill 2 comes with two probes but can handle up to four probes if you want to buy more (sold separately). It has a magnetic base as well and should be stored indoors between uses. This option has a digital temperature display and a 200-hour battery life, priced at $99. The iGrill 3 is compatible specifically with Spirit II and Genesis II gas grills (and Genesis II LX grills if you have a pre-2019 model), so you'll need the iGrill 2 or iGrill Mini for charcoal grills or grills from other Weber model lines. It does not have an LED display on the face of the probe "hub," so it's best for people that want to monitor their cooking progress solely from their smartphone. Unlike the other iGrill options, it "permanently" mounts to the side table in a cutout found on the supported models, so it's designed with weather resistance in mind. Bonus: it can keep track of your remaining fuel, too! It has a 250-hour battery life and retails for $99. 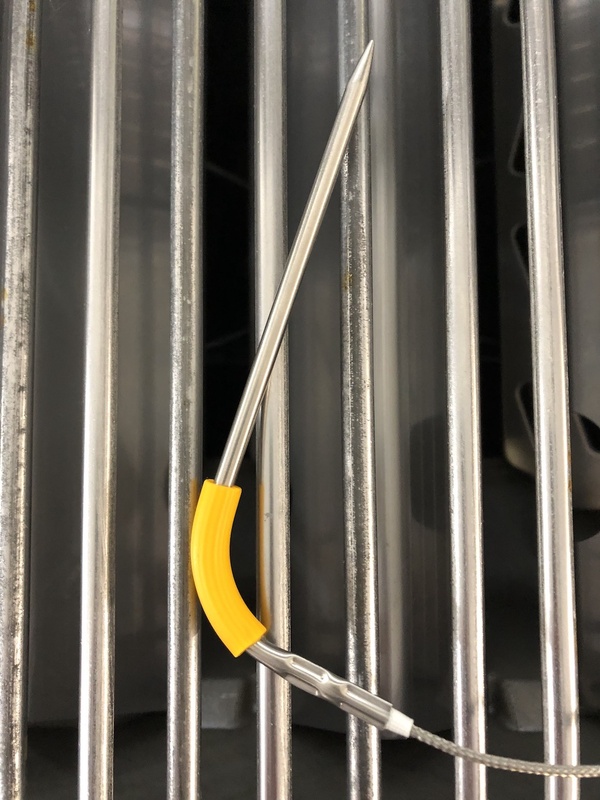 Weber offers both meat probes and ambient temperature probes that are double crimped for increased water resistance. The probes are all interchangeable between the different iGrill types. Examples of non-compatible devices include the iPhone 4, 1st or 2nd generation iPads, and Huawei phones. The app is nicely designed and easy to use. First, you'll need to pair your phone with the iGrill through the app. The app guides you through this, step by step, and Weber even has a blog writeup on it for extra help. Then select what type of meat you're cooking and how you want it cooked, and Weber's extensive temperature library will show you the ideal internal temperature. You can also set custom and preset temperatures. If you like, you can create a Weber-ID account (optional) to save and access past grilling history, add photos and notes, and more. You can check on the progress of whatever you have cooking with the app's temperature graphing feature, too. Weber has consistently updated this app since it was released in 2016, and you can access customer support as well as manuals and guides through the app as well. Looking at the Play Store app reviews, you can see that Weber replies regularly to people who leave reviews and is eager to help their customers. It's just another reminder that their customer service is hard to beat! The only real limitation of the iGrill is the Bluetooth technology - and this has more to do with your individual smart phone or tablet's capabilities than with the iGrill itself or Bluetooth 4.0. Bluetooth can make your phone or tablet battery drain more quickly than usual, and connectivity can be affected by issues like wireless interference and transmitting through physical obstacles like thick walls. If you have an older smart device, check to make sure it meets the requirements for the iGrill. That being said, Bluetooth 4.0 can transmit over 200 feet, which should be more than enough for relaxing inside or in the backyard while your grill is chugging along. That's a pretty long leash! If you run into trouble, get in touch with Weber! They have a lot of help topics covered on their website as well. Overall, the Weber iGrill is a great way to "level up" your grilling abilities! What do you think about the iGrill? Leave us a comment below - We'd love to hear from you!